Wormwood, all new 6-part Netflix series created by master documentarian Errol Morris, streams and also gets a limited release in theaters as a 240-minute film on December 15. Morris, known for his unique style and journalistic candor in finding the truth, achieves something truly unique and remarkable here. I had a chance to talk to one of the stars (in the narrative part of the series), Christian Camargo, a veteran stage actor, known for his dramatic roles in Dexter and Penny Dreadful. Camargo plays a conflicted military scientist who witnesses a murder of a fellow scientist and the government cover-up. Eager to share his enthusiasm on the project, Camargo elaborates at length on what it's like working with Errol Morris, playing a real life character and being part of the genre blurring, groundbreaking project. Screen Anarchy: Just finished watching WORMWOOD. Even knowing Errol Morris’ previous work, I was struck by how incredible it was: a really fascinating subject and story and how it was told. Everything was really incredible. I am wondering how you got involved with the project and how the process was for you. 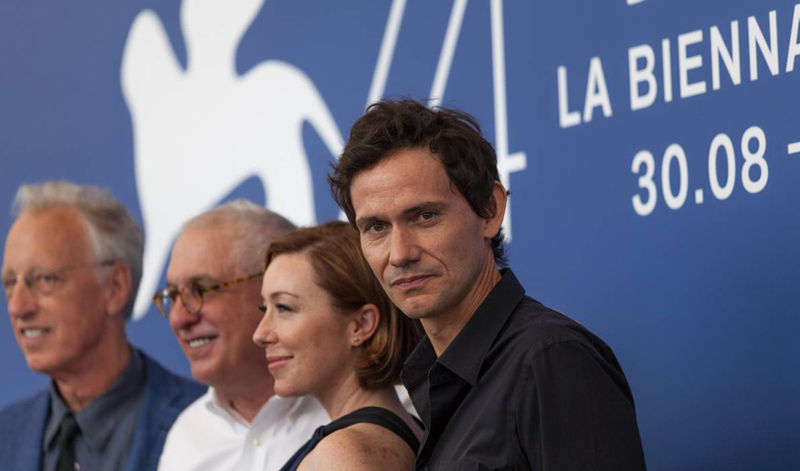 Christian Camargo: I first got involved with the project through Cindy Toland, the casting director for the project. I’ve known her for a very long time and am a huge fan of Errol Morris. They reached out to see if I was interested. You know, I’d do catering for him. (laughs) I would do anything to see how he works. And I adored working with him. This is not just a lip service, I truly mean it. He is like a… an irreverent Bodhi Satva. He uses everything in his arsonal to create a story that has a cause and direction greater than him. Does that make any sense? He is manipulating the artform but not manipulating the truth of his experience and of our experience. So what comes through is kind of absolute truth that we as a viewer have to discover. In a way he does it, he does it with great intensity and great joy. He doesn’t have patient for conflict which is extremely liberating from an actor’s standpoint. The concept of having this double genre - both documentary and narrative fiction is new, you know. It hadn’t been done, even he hadn’t done it quite this way before. So he really surrounded him with the people he was able to trust and entrust with telling the story, including Igor (Martinovic), who is an incredible cinematographer. He gave us freedom to sort of come up with characters. Robert Lashbrook, the character I play, there was one small picture of him and that was it. You don’t know anything about him. There is nothing online about him. He is very much a mysterious character. But for me it was extremely freeing to discover. Now for Peter Sarsgaard, there was a lot more material to work off of. But still there was a lot of freedom and liberty to be had. The scripted part, we treated as a movie. Errol really encouraged that. We had a true story - Eric Olson. And the scripted part, we had that liberty. Between Errol and Steven (Hathaway) who edited the series, they found a language that echoed one another. I think he did this on purpose: he chose actors who are very familiar with Hamlet as he uses that in the story of Eric Olson. You are very familiar with Hamlet with your background in theater! Exactly. He wanted that theatrical echo of the piece. But also what I loved about it was he allowed us to get rid of dlalog and work through silence and through image. Interesting. Haven’t thought about that. As you know, the amount of dialog that was going with Eric Olson with that storyline, so it was really fun to play from moment to moment. I imagine that actual script must’ve been pretty short. I know what Errol is always after. It’s that kind of rabid passion. In this case it’s Eric (Olson)’s rabid passion for finding out what the truth is. Is that part of insanity or that it part of all of us should be pursuing? One thing I was struck by is how conflicted your character, Bob Lashbrook is of all characters. Probably the most conflicted character in the whole series. What was your take on the character? I’ve played few bad guys in my career. And I really love the psychology behind what makes people do certain things. That it is never black and white in my mind. The little I knew about Robert Lashbrook is that he wasn’t a heavy, muscle man. He was more of an intellectual on the science side of it. So I really looked at the situation - playing on both sides, and how tenuous, how in different waters they were all walking. In a time where we had Cold War and all the pressures from the administration and J Edgar Hoover and what was happening in America at that time…which is not completely dissmilar to what’s happening right now. You know there is nationalistic front and we are sort of heading back to McCarthy era. There was a tremendous amount of concept and senses of ‘what is duty?’ you know? ‘What is right thing to do?’ The tragedy of Lashbrook for me was his sense of powerlessness. Following orders. There is sinister quality to him and I wanted to feel like he was sinister force but all of sudden I realized that he didn’t have any power. He just allowed the murder to happen. We found a lot of these conflicted moments. He just allowed that to happen. I enjoyed playing him. It gave more dimension. The historical aspect of Wormwood. With MKUltra and germ warfare and all the so-called conspiracy theories, I found very interesting. I grew up in Korea but no one really talked about germ warfare in Korean War at all. Did you have any knowledge of these events prior to the production? Actually I had some knowledge of the (POW's) confessions. But I thought they were just coersions and they ere brainwashed and that this was all part of war system. With the amount of information that are out now, it’s not hard. There is enough to give you the shadow of doubt about whether this was coersion or whether this was in fact, people telling the truth. And we do know now that the chemical weapons were made at that point in America. And yet, this little dark secrets have been going on for decades. And we need to understand as Americans that we are all culpable. We are complicit. And in the whole grand scheme of what is… in some circle, what’s wrong with humanity? That’s also another subject that is very Hamlet-esque. Errol has tapped into this, at such a time where the country is so polarized. And a lot of left-leaning liberals are pointing to this presidency as ‘this is the time where America is the worst’. No, this has been going on like this for years and years. It’s only through people like Eric Olson who are commited to figuring out what the truth is that that the light is shined on these indiscretions. It’s a momentous subject to have in our time right now to get to people to seek the truth. Unfortunately it was at the cost of very brilliant career that Eric had. And hopefully that’s not over. He will continue this work now that this story has come out. Because he is really a fascinating person whose work needs to be recognized. As Errol concludes that Eric knows the truth now, we have to reconcile the fact that there is no clear cut winner in this situation. Like wormwood, everything is bitter, everything is contaminated. Absolutely. That is what will come out is that there isn’t. It’s all dirty. It’s one of the human conditions. What comes out is that there is no clear winners. There are definitely losers. I mean, Frank Olson was on the losing end. But there are no winners. No one comes out with their hand completely clean. Really the underneath point to all this is that this legacy is handed over to us, to the viewer, the audience that our hands are not clean either: ‘If I allow this to go on, my hands are not clean’. You think WORMWOOD is going to be the momentous occasion for the visual, storytelling medium that will change everything- cinema, TV, streaming services, etc.? Yeah. There has been a lot of interests in reality based long form non fiction. But it’s not being done the way… well, it has been done in a subversive way, as in ‘we are following this documentary along then it becomes narrative'. But in that way the filmmakers are skewing it for their own purpose. But it’s never been done in such, ‘here we are, we have a real person, we have fiction, we have script, we have freedom. It’s hysterical because I think this is up for Academy Awards for Narrative but not Documentary category. (laughs) Classic human condition. Real life is like this. It gets all murky. There is no genre here. It’s completely hybrid. It’s totally new. And I think it will open doors to whole diferent types of storytelling and people don’t have to pigeonhole them. And the industry has to catch up. Many people ask me what the project is like- is it a thriller? Is it this or is it that? I really hope and I can’t imagine that this won’t be successful enough to influence whole new way of thinking that we can allow the viewer, which Netflix does so well, to choose. You don’t have to be fed a genre. It’s not about statistics. I’m pretty hopeful and sort of idealistic that Errol is bringing the art back to the form. Wormwood will be released in select theaters and will be available globally on Netflix starting December 15.